Legal support tailored specifically to your business needs. No matter how much effort you put into making your business an enjoyable place to work, sometimes there are employment law issues. 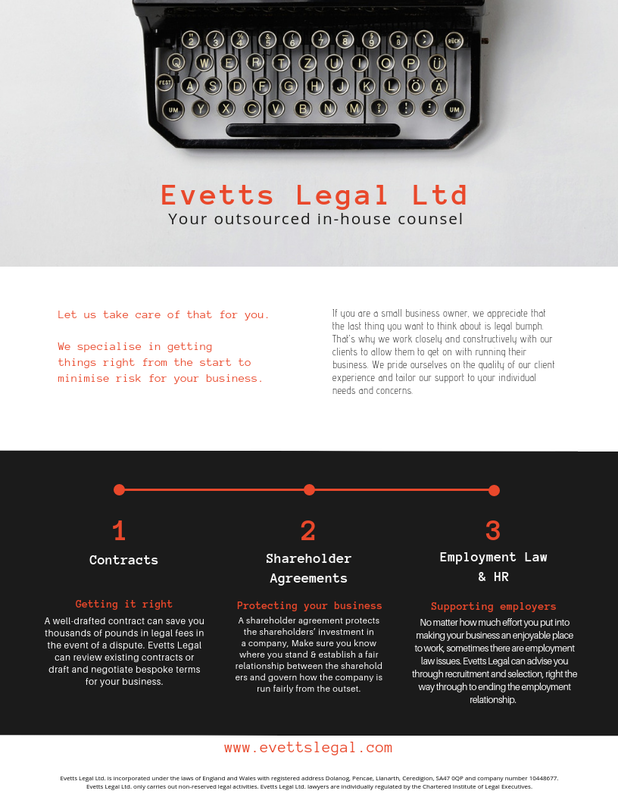 Evetts Legal can advise you through thecorrect processes, from recruitment and selection, engaging employees, handling workplace disputes and business changes, right the way through to ending the employment relationship. In business, getting your contractual terms and conditions right is a must. It gives all parties to an agreement a clear understanding of their duties and responsibilities. A well-drafted contract can save you thousands of pounds in legal fees in the event of a dispute. Evetts Legal can review existing contracts or draft and negotiate bespoke terms for your business. Depending on your matter, we can offer an hourly, daily or fixed project rate. We will have an initial discussion to consider your legal needs and identify the fairest payment solution based on the complexity of your matter and the actual time taken. Some indicative rates are included below. Most of our clients engage us on a day rate. We charge these rates based on the actual hours worked on your matter and retain a detailed record of the chargeable hours we have spent on your matter. Our standard day rate is £850 based on a working day of 9-5. Our standard half-day rate is £450 based on a four hour half day. Where possible, we will offer you a fixed fee for handling your matter. This fixed fee will depend on the complexity of the work.